Colin Baker (The Doctor), James MacCallum (Isambard Kingdom Brunel), Christopher Fairbank (Marc Brunel), Catherine Bailey (Tan), Imogen Church (Rispa / Lady Raffles), Becky Wright (Flo Hawkins / Alayna), Anthony Townsend (Richard Beamish / John Chubb), Sam Woodward (Charlie / Lord Raffles / Captain Sanderson), Richard Unwin (Tour Guide / Scientist). Other parts played by members of the cast. We Big Finish listening Doctor Who fans, seem to continually be on the lookout for new audio adventures through which to introduce possible converts. Less so a perfect ‘Jumping on point’, more a short introduction that perfectly epitomises Big Finish, without much continuity to speak of. Well I’d like to add Iron Bright to that list. The second of the sixth doctors main range trilogy this year seems to harken back to the earlier days of Big Finish, being a completely stand-alone adventure with seemingly very little to connect it to last months; The Lure of the Nomad. Not only that but Chris Chapman has described his story as a ‘celebrity historical’ in the Russell T Davies vein and certainly it conjures images of The Unquiet Dead and The Shakespeare Code amongst others. Aside from just being a phenomenal showcase for what Big Finish can achieve, Iron Bright is an incredibly produced drama with a wonderful story, excellent cast and superb direction. The story revolves around the building of the Thames Tunnel by both Marc Brunnel (Christopher Fairbank) and his son Isambard (James MacCallum), which is haunted by a mysterious blue lady. Of course much of the emphasis is placed on the young Isambard and James MacCallum is a wonderful choice for the role, indeed he steals much of the show and presents us with a multi-faciated and completely believable character. Not only that but he achieves all that with a historical figure who has been interpreted a million times before and still MacCallum manages to present a fresh and likeable figure. it’s a superb performance and I hope to see much more of him yet. And what of the Doctor? Colin Baker is superb as ever and indeed I personally enjoy his doctor far more in a historical setting, finding that the writers seem to enjoy the sixth doctor attempting to ‘act with the times’. This paves the way for some wonderful comedic moments. However Colin really shines when working with MacCallum and the relationship between the Doctor and Isambard is one of the joys of the audio. However it's unfair to concentrate on these two alone when the entire cast is wonderful. There’s some show stealing parts for Catherine Bailey, Imogen Church (who makes a formidable villain) and Becky Wright. Bailey and Wright in particular have a wonderful chemistry and provide two characters who are just as interesting as any of the historical figures. The sub-plot featuring these two is one of the highlights of the drama and Chapman was lucky to have two such wonderful actresses to portray it. this sub-plot also manages to provide a little historical context away from the Brunels, providing us with an original historical character whose arc is just important as anyone else's. And what of Chapman’s script? Well it’s certainly something of a ‘block buster’. Starting with a creepy and slow building ghost story (something doctor who has always done well) the reveal is made around the half way mark and the story switches gears, emphasising the science fiction. Rather than harming the story in anyway by having a definite change of tone, this actually works wonders and in particular manages to show varying sides of Isambard. Indeed one of the wonders of Chapman’s script is that it’s so intently rooted in ideas of industry, progress, engineering and machinery that are so central to Isambard’s place in history. The fascinating moral dilemma posed in episode three presents us with incredibly sympathetic villains and indeed Imogen Church manages to gain listeners sympathy, between some incredible comic moments. Of course it would be remiss of me to not mention the excellent sound design and musical score which seems to be a trademark of Big Finish's high quality. The blue lady herself is terrifying (and the general idea behind her is a genius one that’s incredibly haunting) whilst the various sounds within the tunnel provide a chilling setting, constantly reminding us we're under ground. The story is helped by a wonderful score that seems to fit it’s epic scope, getting gradually more bombastic towards the end. All in all, Iron Bright is a truly wonderful example of just what Big Finish can achieve. Simply everything works and the result is one of the best the main range has put out in a long time. A magical, superb adventure. In an ever-fluctuating world where political regimes collapse as fast as they emerge, where once-indestructible business behemoths perish like wanton flies and where the fate of any TV show hangs by a knife-edge daily, only one immutable truth is certain – nothing lasts forever. Just ask the original production team behind Torchwood’s TV run; the first proper Doctor Who spin-off show rapidly grew from strength to strength between 2006 and 2009, only for its divisive – to say the least – fourth season Miracle Day to abruptly bring about its on-screen demise. Big Finish’s intervention couldn’t have come soon enough, then, delivering fans with gripping new adventures that reveal both unexplored missions for Torchwood Three and never-before-seen facets of the wider secret agency. However, as with the show’s televised tenure, surely the studio’s luck will run out eventually? After several superb boxsets and almost 20 standalone instalments in the range, not least March’s riotously entertaining The Death of Captain Jack and April’s rib-tickling country getaway The Last Beacon, that question weighed heavily on this reviewer’s mind as he hit Play on the monthly range’s latest instalment, We Always Get Out Alive. It couldn’t have come to the fore at a more opportune time, however, since for all his experimentation with haunting horror-esque setpieces, Guy Adams’ focus lies squarely on the matter of mortality and for how long those bold – or reckless – enough to risk it as part of their profession can hope to outrun the tentacles of fate. Of course, many civil servants do beat the odds every day, returning home to their loved ones and living to fight the next battle, but those of us looking in from the outside can only imagine the intense emotional strain that such an unpredictable, risk-laden lifestyle would place on those relationships as time passes. Indeed, between facing down drug-addled aliens demanding 10% of Earth’s younglings as a gift, cannibalistic guests at their own wedding and at times the very worst of humanity, Gwen Cooper and Rhys Williams have amassed their fair share of emotionally traumatic baggage over the years. While we’ve seen their inevitable resultant tension bubble to the surface in fleeting moments of the show to date, nowhere has the subject been explored in greater detail than with Alive’s psychodrama-driven narrative. Adams manipulates the pair’s growing anxieties with magnificent aplomb; as they deal with the fallout of a recent mission-gone-wrong, his script masterfully reveals how, through Rhys’ fears surrounding his wife’s nonchalant attitude to brushes with death, even arguments over the right turn to take on a near-deserted rural road could pose just as substantial a threat to their challenged marriage as the mysterious forces manifesting in their vicinity. It’s as cunning a metaphor as any for the ongoing struggle surely faced by soldiers, firefighters or the like in relationships, delicately deconstructing this fraught dynamic while seemingly revealing huge admiration on Adams’ part for those couples whose love and loyalty endures regardless. This mounting tension extends far beyond the couple itself, their obligatory alien pursuer sure to unsettle even the most steeled listener on their own travels. As with many of the great antagonists in fiction and especially within the horror genre, it’s to Adams’ credit that he wisely leaves much of the nameless foe’s facets up to our imagination, cunningly keeping it just outside of our heroes’ field of perception while having its influence gradually rise through lost memories, spontaneous outbursts of rage from Rhys and Gwen as well as fleeting thuds from the Cooper car’s boot. The latter element is also aided in no small part by Alive’s brilliantly subtle sound design, which keeps us completely on edge to the extent that moments of silence ratchet up the fear factor just as much as the distant howls, ominous rustling and increasingly audible footsteps somewhere nearby the vehicle. A word of warning: don’t listen in the dead of night unless you’re well-versed enough in the realms of horror to endure Alive’s eerie gothic atmosphere. Suffice to say that this reviewer scarcely regretted his decision to hit Play in the broad daylight of his train journey to London. But as much as it goes without saying at this late stage, beyond its chilling script and technical strengths, by far Alive’s finest assets are the two performers tasked with delivering each and every line on this occasion: Eve Myles and Kai Owen. Gwen and Rhys’ tempestuous yet heartfelt dynamic has long served as the franchise’s emotional core thanks to the pair’s grounded performances and nothing changes here in this respect; Owen recapturing Rhys’ risk-averse approach – from tackling missions to heeding the highway code – perfectly, while Eve’s portrayal recalls Clara Oswald’s arc in Doctor Who Season Nine, her relentless energy as this undaunted yet reckless heroine a simultaneously thrilling and worrying ‘sight’ to behold. Nor does it hurt that Alive offers both thespians the opportunity to display perhaps Torchwood Three’s sole surviving recruits – depending on whereabouts in the show’s timeline Alive is situated after Children of Earth – at their most personally vulnerable, albeit with plenty of well-timed jokes such as the lasagne gag above enabling vital catharsis for the players and audience alike. Usually, you’d expect us to highlight one or two shortcomings holding the latest Torchwood release back from the Hall of Fame around about now, right? Well, think again – such is the scale of Adams and company’s magnificent achievement that almost no noteworthy flaws sprang to mind as the credits rolled. Similar to how Cascade left the door open regarding the eventual fate of Toshiko Sato’s consciousness, so too does Alive refuse to fully acknowledge whether the faceless threats – both extraterrestrial and psychological – besieging our ever-wearying protagonists have truly subsided come the play’s conclusion, particularly given Adams’ insistence upon subverting our sense of reality throughout. That ambiguity only serves to strengthen the play’s societal subtext though, speaking to the ongoing struggles inherent in any marriage and indeed the joint trauma that couples tested to the limit must learn to live with somehow, rather than finding any idyllic quick-fix solution to such woes. In contrast, however, this reviewer can wholeheartedly lay any fears surrounding the longevity of Big Finish’s Torchwood range to rest. Between the outstanding opening half of this fourth monthly run of one-off outings, the long-awaited gratification of the original team's reunion in Believe as well as the exemplary note on which Aliens Among Us concluded in February, far from spreading itself too thinly across myriad strands, the show’s never been on better form than it is today. For those wondering where to start with exploring the franchise in audio form, Alive represents an ideal entry point, its captivating thrills making 45 minutes feel more akin to 15 and its standalone nature – no Committee mentions in sight here – preventing the need to pick up ten prior releases in order to stand any chance of understanding what’s occurring. 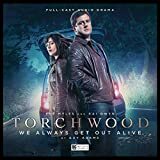 As for the rest of us who’ve grown alongside Gwen and Rhys over the past 12 years, the harrowing setpieces, multi-layered performances, stunning sound design and stirring societal themes make We Always Get Out Alive nothing short of an essential purchase. The hardcover large-format book, 100 Illustrated Adventures, published by Puffin highlights one hundred of the Doctor’s ‘most wonderful, jaw-dropping and eye-popping escapades’ and claims to bring these episodes to life like no other episode guide. So does it live up to this billing? The book is (almost) bang up to date, covering the show all the way up to the end of the 2017 series. Most stories are given a double page spread which includes a brief episode guide on one page – the incarnation of the Doctor and his companions, first transmission dates, number of episodes and the writer, along with a very brief (around 200 words) story synopsis. The other page is typically devoted to a related piece of artwork. It is these, as the ‘illustrated’ in the title suggests, that are the selling point of the book. These were gathered from the publisher’s Illustrated Adventures competition which has provided art in a variety of styles ranging from detailed pencil drawings (including some stunning portraits) to abstract representations, and from comic strip styles to children’s drawings. These are therefore original pieces of art that you won’t have seen anywhere before, and whilst the breadth of styles means that not all the art will be to everyone’s taste they all display great talent, imagination, and creativity and show a love for the show. The inevitable question with this sort of book – is my favourite story in? Well probably - If we take the DWM 2014 poll as a benchmark most of the top 100 from that list are in and you have to get to 38th in the poll to find a story not included in this book (The Daemons – sorry!) and all in all only 32 of the DWM top 100 are not included here. The choice of stories to include may also, therefore, be an interesting point of discussion for fans. Overall the book is clearly aimed at the younger reader and as an episode guide probably works better for the newer fan than for someone who has followed the show for a long time. However, as a delightful, original collection of art that shows the passion and imagination of fellow fans, it works for all, young and old alike. The 11th Doctor’s entry into the Target books range sees Steven Moffat novelise his 50th-anniversary celebration with two closely intertwined plots in a timey-wimey multi-Doctor tale. The first plot strand sees the Doctor joining forces with his previous incarnation and the recently introduced War Doctor to thwart the Zygons who, having found themselves in Elizabethan England, hatch a plot to take over the Earth in the future. However, the second plot strand which sees the Doctor confront his role in ending the Time War is more significant, addressing a major theme running throughout the series since its return in 2005. This is arguably given even more weight in this novelisation than in the televised version, exploring the pain arising from his actions in a more personal way. In revisiting the response of his Ninth incarnation at the end of The Parting of the Ways however, this book makes the point that the choice the Doctor faced here is the same impossible choice he has faced on many occasions. This is the longest of this new batch of novelisations, perhaps understandably given the extended running length of the TV episode and the multiple plot lines, but also given that it covers the brief prequel, ‘the Night of the Doctor’. Add to these the addition of new material and this feels a more substantial novel than the other recent releases in this range. It also has a very different feel to it, demonstrating the versatility of earlier entries into the Target range. Here, each chapter is written from the perspective of a different character, often in the first person, making each one feel fresh while challenging the reader to work out the identity of the author. This story-telling device is put to particularly good effect when recounting the Doctor’s journey to the Tower from the perspective of each of his incarnations in turn – a journey his later incarnations have obviously experienced before. It also allows for the injection of some humour at the expense of the Doctor and other characters, the former being variously identified as Bow Tie, Daddy’s Suit, Pinstripe, Grumpy, and Neckwear. (As a side point, reference to the Tenth Doctor’s ‘tight suit’ would surely become a standard Target description of this Doctor should the range be extended, much like the Fifth Doctor’s “pleasant, open face”). Each chapter is also preceded by a communication to readers from the narrator, an archivist who seems to be piecing together events in the story. For me, the style of these interludes seemed very similar to those of Moffat’s DWM Production Notes. I anticipate that this may grate with some readers and might be expected to interrupt the flow of the story, but for me these did make for refreshing breaks and a lightening of the mood in some of the book’s more serious moments. Moffat also takes the chance to add to his original story, the most notable addition being that of a small but not insignificant role for River Song, perhaps understandable as one of his most significant character creations. There is also an extended description of the Doctor’s integration in the Court of Queen Elizabeth and, of course, reference to Chapter 9 which claims to resolve so many of the show’s big questions and controversies is a typical example of Moffat playfulness. He has further fun with the first two Doctors here being identified as colour blind and the Doctor also refers to the Peter Cushing Dr Who films and is even reported to be consulting with Cushing on a third film. As one would expect from an anniversary story there is lots of fan-pleasing continuity with references to the great and the good from the show’s past, including Ian and Barbara, The Brigadier, Sarah Jane Smith and Susan. The grand finale still sees all the Doctor’s incarnations join forces though here it is in a somewhat different manner to the TV episode and a significant addition comes right at the end of the book with a brief postscript featuring the thirteenth Doctor. And as with many Target novelisations this one also takes the opportunity to extend the roles and significance of supporting characters - here Queen Elizabeth and McGillop are the main beneficiaries. The absence of the Daleks is though more apparent in this book. Although they are an important part of the backdrop to the story in terms of the Time War – without the impact of their on-screen cameos they are effectively absent here. This novel then has more serious undertones than the first two additions to the Target range but is not without its moments of humour, which, as in past multi-Doctor stories are principally in the interactions between the various incarnations of the main character. It is a book written very much with fans of the series at its heart, but going beyond the continuity this is never clearer than the beautiful moment when the War Doctor promises that whoever hears the wheezing, groaning sound of the TARDIS will know that they are not alone. While this is of immediate significance to the Doctor in the context of the story, this is surely also speaking to the fans and their relationship with the Doctor. The Day of the Doctor immediately soared to the top of the DWM poll of TV stories and I’m sure this novelisation will be held in similarly high regard. Georgia Tennant only guest starred on one episode of the show, but her character left an imprint on the series. The ending of that episode left fans wondering if she would ever return. Particularly as rumor had it that Steven Moffat had made the suggestion to Russell T Davies to have Jenny live...people long assumed that meant he had plans to have her return. But, alas, she never did under his tenure. So Jenny was seemingly a character that was teased to make a return, but probably never would as creative teams move on. But isn't that exactly the reason we have Big Finish? Particularly as having the show back on TV makes Big Finish the perfect place to explore the more obscure cracks of the Doctor who universe. So Georgia Tennant (who as many fans know is the daughter of Fifth Doctor Peter Davison, and current wife of Tenth Doctor David Tennant) gets her chance to revive the character, in her very own Big Finish boxset. The results are entertaining, as Georgia Tennant proves a charming and likable lead. The opening story Stolen Goods sets the tone, with Jenny getting into an accident with an alien that looks like a frog in a suit (sorry, salamander), and while the amphibian alien tries to con Jenny out of a bunch of money, she is also being pursued by some kind of cyborg that wants to capture a Time Lord. She also meets a frozen man who is even more new to the universe than she is. It's a fun opening, particularly Stuart Milligan as Garundel, who sounds like he is doing a bit of a Paul Lynde impression. Prisoner of the Ood, involves the Ood on Earth, trapping and turning people in the village into Ood.The reasoning behind that strange plan slowly reveals itself as the episode goes on. As the mystery is one of the few things this episode has going for it, I won't get too deep into details on it. I wasn't as engaged with this second story as I had been with the first. I am a fan of the Ood and I think Jenny is a decent Doctor stand-in, but it lacked the energy and fun that was so present in the opener...and ended up feeling like a standard Doctor Who story, though with an inexperienced adventurer in the lead. In the end, the episode feels more like an excuse to use the Ood, and not anything that seems worth it to have them. Things bounce back for the third entry, Neon Reign, which is creative and fun, even if the message is too on the nose. Jenny and Noah end up on a planet being ruled over by a sexist dragon which forces woman to serve men who stay at home and do drugs all day. The female empowerment message lacks any real subtlety, which is a shame, but at least the story features a dragon and some crazy high concept stuff, which makes up for it. At the very least the supporting characters in this one were more interesting than the Ood story, and it was well paced with interesting story bits. The set concludes with Zero Space, which finds Jenny and Noah lost in an area of space with nothing in it. Well nothing except a big research space station being run by 200 clones of the same two people. And their ability to clone so perfectly is a decidedly dangerous place to be when you are as rare as Jenny and Noah and being pursued by a crazy cyborg bounty hunter that wants to sell you to the highest bidder. Being able to have spares to sell would come in handy! The finale to the set is pretty good, though there was definitely a moment or two where it was clear they wanted a certain plot device to remain a twist or have a big reveal...and that lead to me actually yelling "get on with it!" when I had figured out where it was probably heading and they kept teasing out the information. The concepts were all interesting on their own, they didn't need a big twist to keep it entertaining, and holding back and having characters constantly hold back from saying what they mean just frustrated me a bit. Which is a shame, because beyond that it is a great climax to the box. Jenny: The Doctor's Daughter, is an enjoyable new set from Big Finish. It isn't their most exciting new range, but it has a lovable lead and has potential to become something quite entertaining. It just isn't all there yet. One of the nice things for Big Finish going into this set, the character of Jenny was such a blank slate that they really could have gone anywhere with her. There wasn't that much to her in the original episode. Here she is a fun character to ride along with, even if the stories within a bit uneven, at least you can count on the lead performance...and is there anything more Doctor Who than uneven storytelling with a consistent lead? Fans of the Tenth Doctor or the new series will probably find something to like in here, it may not be perfectly executed, but it is still pretty fun.